Weda Mohseni leads by example and has a passion to help the community. She is an inspirational leader in the Afghani community encouraging women and girls to further their education and consider volunteer work. “I just love helping other people grow, it is immensely satisfying,” Ms Mohseni said. “It is wonderful to see them achieve their personal goals and see them and their families thrive. They are the true inspiration, not only to me but the whole of our community. “I know that women have a lot more to offer than staying home and looking after the children. They can study and become anything they want,” she added. 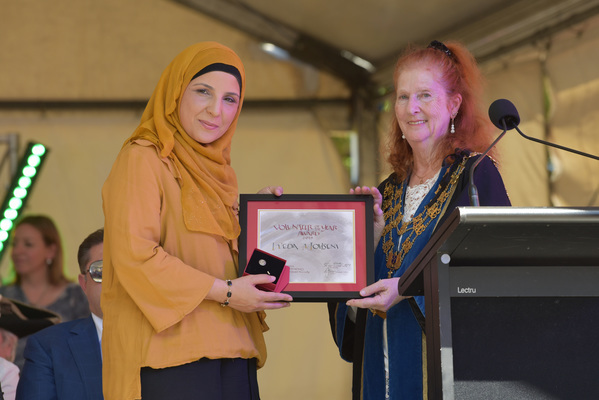 Ms Mohseni was named the joint winner of the Volunteer of the Year award during City of Greater Dandenong Australia Day ceremony. The honour was bestowed on Ms Mohseni for her service as an active member of the community and engaging in multiple projects run by community organisations. “I want women to be empowered, get their own job, and stand on their own feet, understand their rights. That’s my goal for them. Ms Mohseni initially performs a face-to-face interview with job/study seekers some basic questions including their personal goals, aspirations, and their current life responsibilities. “(This) determines if they will achieve a good life balance through part or full time work/studies, while also taking into account their previous studies and work experience but more importantly to ensure that these activities fulfil them personally,” she says. “Some clients do experience limited English skills and also need information regarding Australian lifestyle and culture awareness. Since arriving in Australia in 1995 from Afghanistan, Ms Mohseni has had the opportunity to further her studies including a Diploma of Community Development, Social Welfare and Case Management Chisholm Institute and Training/Assessment certificate. She aims to provide people with information regarding further training which is suitable to their current level and needs and which fits within their daily life.